Although khichdis are thought to be apt for sick days, Truweight has tried to make it tastier. This khichdi holds a lot of potentials to be tweaked to better suit the nutrition needs when on the weight loss too. Nutritionists recommend consuming 5 servings of fruits and vegetables in a day. What better way to incorporate healthy veggies than add it in the humble khichdi. To make it even more wholesome, we have used brown rice for an extra punch of B-vitamins and fibre. So go ahead, enjoy this simple yet nutritious delicacy that can cure even the worst homesick souls! 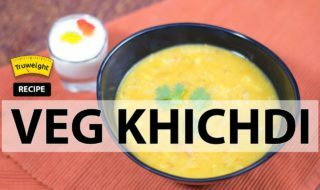 Take ghee in a pressure cooker and add cumin seeds, turmeric powder and asafoetida to it. Saute them. Add bay leaf, onion, carrot, cauliflower and tomato to it and saute. Add chilli poeder and sprinkle some salt to it. Then add moong dal, soaked brown rice with a required amount of water. You can now serve your healthy and tasty brown rice veg khichdi.